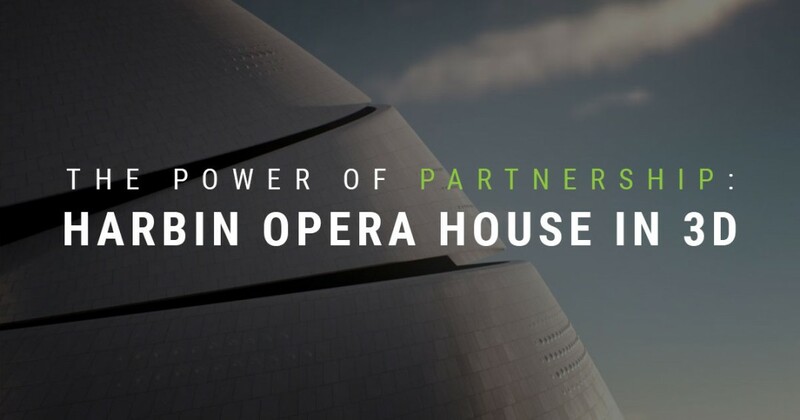 From start to finish, the importance of our relationships with industry partners is shown prominently in the creation of our Harbin Opera House imagery and film. By now you’ve heard the news. 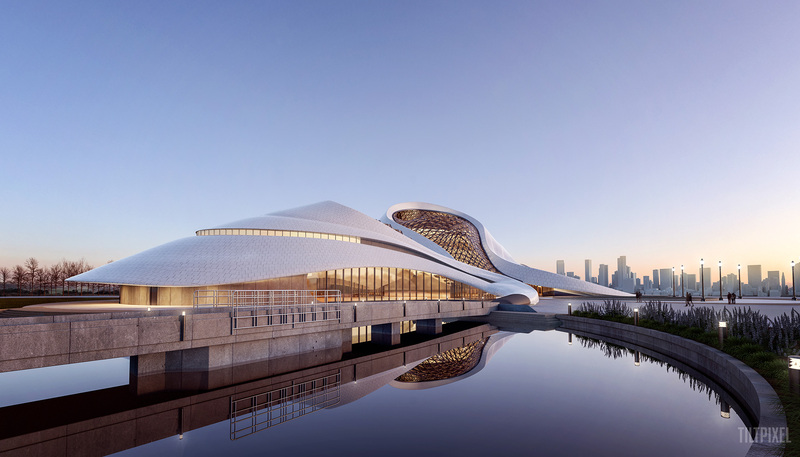 We were beaming from ear to ear when we announced that CGarchitect, the premiere professional community for architectural visualization, nominated our rendering of Harbin Opera House for a Best Commissioned Image Award. It’s a big deal – for us as a studio and for our artists as well. 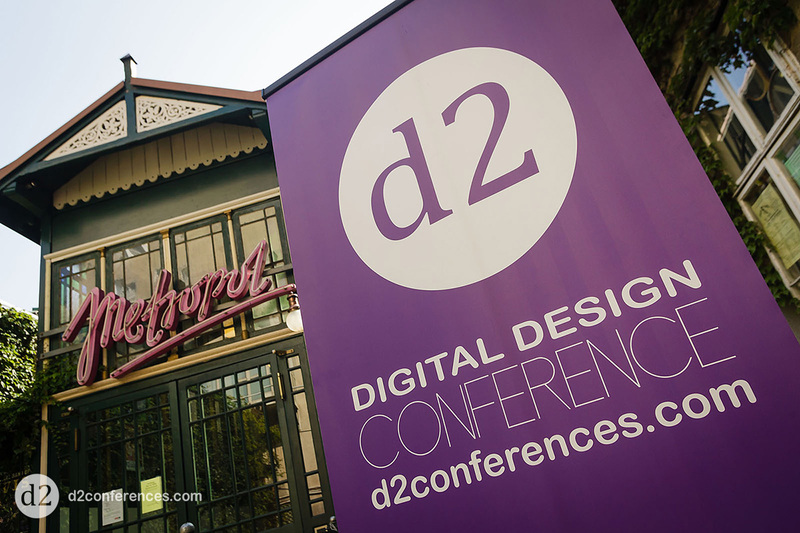 And we were equally thrilled to participate in the awards ceremony at the d2 Conference in Vienna last month. While we didn’t come home an ultimate winner (kudos to Recent Spaces who did), we felt extraordinarily proud to be amongst such talented company. The best thing about this nomination, and the subsequent film that came out of it? It reflected industry partnerships that routinely push our studio to greater things. Late last year, we were approached by Chaos Group prior to their launch of the new V-ray for Form-Z. Their team requested that we create a rendering to showcase the power behind this improved duo. Form-Z is not a typical part of our production process, but we were eager for the chance to work with Chaos Group and AutoDesSys, the brain force behind the Form-Z modeling software. The project would rely on close collaboration with both companies as we experimented with the Form-Z beta version and participated in routine feedback forums. 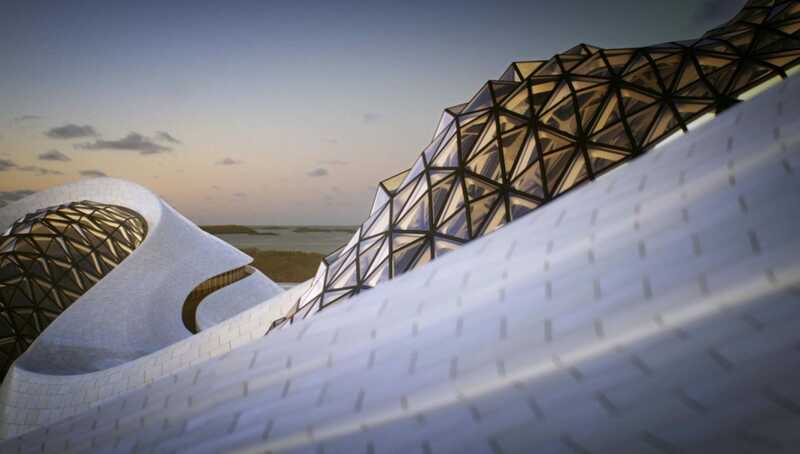 After debating dozens of options, we chose MAD Architect’s Harbin Opera House as the subject of our rendering test. Harbin’s dramatic curvilinear façade was designed as a seamless extension of its surrounding landscape. A work of paralleled art and beauty, the structure provided a technical challenge that would allow TILTPIXEL artists to showcase Form-Z’s power and utility when paired with V-Ray. Chaos Group and AutoDesSys were excited to see a rendering of Harbin Opera House unfold. The challenge was significant, however, and we quickly fell into a routine of open, constructive communication with AutoDesSys to solve problems and initiate bug fixes. Together, problem-solving was more efficient, and the process elevated the final product. With improvements to our tool set and a strengthening of our industry partnerships, the Harbin Opera House rendering was a clear success from the beginning. Each year, we submit renderings and short films to CGarchitects’ Architectural 3D Awards. The nominees and winners reflect the best in our industry, and we submit eagerly with no expectations of winning or losing. It’s another way to support our industry, to connect and network with incredible studios and artists, and to share our work with the larger community. When we got the call that Harbin Opera House had been nominated in the Best Commissioned Image category, we were downright giddy. The awards are presented in Vienna at the annual d2 Conference, which is billed as the largest gathering of arch viz artists in the world. A celebration of our industry, the conference facilitates learning and networking like none other. The two-day event culminates on the last evening with an awards presentation for the winners. Chaos Group approached us several months ago as they worked towards a public beta release of V-Ray Cloud. Their request was simple: pick a project, test it using the Cloud, report back. They provided a questionnaire that guided our responses related to render times and workflow impacts. Their goal, and ours, was to determine whether rendering on the cloud could have a lasting positive impact on our productivity. In choosing the project, we again turned to Harbin. We were so pleased with the still image, yet we felt there was more of the story to tell. Partner, Ramy Hanna, took the lead, artfully adapting the rendering to a larger, more sweeping animation that moved the opera house through space and time. Ramy’s short film magnifies the stunning art and architecture of MAD’s timeless design. Using V-Ray Cloud was an exciting opportunity to measure the benefits and challenges of incorporating cloud rendering into our existing workflow. Because Form-Z is generally not our go-to 3D program, we imported the model into 3ds Max. From there, we went to work, using the beta version of the Cloud and pushing its capabilities by incorporating various tools. The result? The animation speaks for itself. And the Cloud was a surprisingly seamless addition to our workflow. Now, when our internal render farm is bogged down with heavy use, we can rely on the Cloud to churn out smaller jobs without creating a bottleneck in production. This is a huge advantage to a studio of busy artists, as we balance multiple projects on a daily (and sometimes nightly) basis. Who knows? Perhaps V-Ray Cloud will ultimately replace our internal farm altogether. Until that happens, we are grateful for the improved productivity that cloud rendering can lend to our existing workflow. Most importantly, we will continue to collaborate, experiment and innovate with the industry partners that create the tools we need to do the work we do. Our relationships with firms like Chaos Group and AutoDesSys are a testament to the fact that nothing great happens in a silo. It is through dialogue and communication – and a willingness to try new things – that products and projects are elevated, and clients are better served.